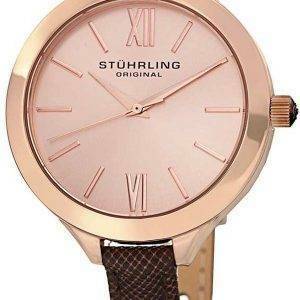 Stuhrling watches are not just mere tools that tell time, but works of art that took form in the hands of skilled watchmakers inspired and following the rules set by Max Stuhrling, the original founder of the brand now run by his fourth generation descendant. From the Stuhrling Original Concorso to the Stuhrling Original Ascot Prime, every Stuhrling timepiece becomes an admirable artwork, admired by casual wearers and watch collectors alike. Whether it’s a Stuhrling Original Classic Cuvette representing wealth and status or the pure luxury of the Stuhrling Original Classique meant for the society’s elite, every Stuhrling watch is now made with improved technology that recaptures the centuries-old spirit of watch making.